Ju Ju Jerky is a brand that I only discovered today while replenishing my supplies of jerky for review. I found it at my local Albertson's grocery store here in Southern California. The company appears to have gotten its start in 2004, offering four varieties of jerky, two of them beef, and two of them turkey. In this article, I'm doing a review of their "original" turkey jerky. 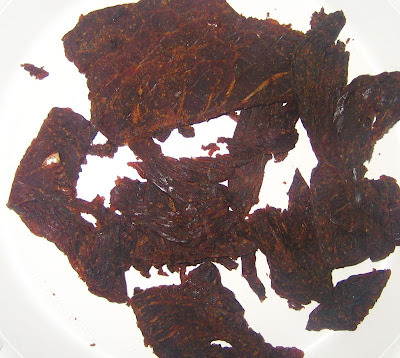 The Ju Ju Jerky brand is focused on marrying jerky with caribbean style flavors, and doing it with no preservatives. Leaving out the preservative is something that I took notice of since I'm now trying to escape from sodium nitrite jerky. Sure enough, no sodium nitrite listed. All I can is "Wow! ", this turkey jerky has a fabulous taste, and tons of it. There is a clearly evident sweetness to it, and I can detect the worcestershire sauce too. As I let the pieces soften up in my mouth, and I can continue to extract more flavor. Probably the first taste that hits me is a combination of the sweet, pepper, and worcestershire sauce. I can also detect some garlic too. The pepper adds a slight spiciness to it, something I'd consider mild, but maybe medium hot to some others. A couple of pieces contained an extra shot of lemon peel, perhaps from the lemon pepper. I found it to be a welcome surprise, adding only more to the flavor complexity. It's not overly salty either. 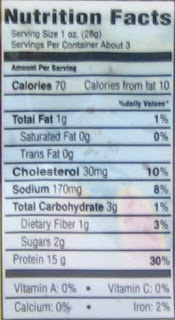 The nutrition label backs that up, with only 170mg per serving, compared to 400-700mg for most other big brands. As for tasting the natural turkey meat flavors, I can't really taste much of it. In fact, if I didn't know this was turkey, I'd think it was beef. There is so much flavoring in there, that I don't really taste any natural meat flavors. The consistency does resemble something like turkey however, that is it doesn't tear apart the same way that beef does. This turkey offers excellent taste, plenty of variety in flavorings, and a mild bit of spiciness. These appear to be real cuts of meat, sliced in average to thin thickness, and in medium to small pieces. Just as the packaging says, these are indeed "moist and tender". They're very easy to tear apart, and very easy to chew. I find myself breaking apart a piece with my fingers, and then sucking on a piece to extract all the flavors, and it almost melts in my mouth. I don't see much at all in the way of fat or tendon, but I did find one piece with a streak of gristle. However it was still easy to eat. Otherwise, these are very lean pieces. Ju Ju Jerky says they use only free range turkey. I paid $5.99 for a 3.25 ounce bag at an Albertson's grocery store in Menifee, CA. That works out to a price of $1.84 per ounce, which is in the average price range, but towards the upper end. As a general turkey jerky, this offers excellent value, with tons of flavor, plenty of flavor complexity, and is very easy to tear apart and chew. I can't stop reaching for more of this stuff. Better yet, it contains no preservatives, and no sodium nitrite. Combine that with its great taste, and you've got something worth your money. I can't tell you if this jerky lives up to its billing as a "caribbean flavored" jerky, since I'm not familiar with that style of cuisine. But it does indeed offer a flavor combination that I haven't encountered in any kind of jerky. I always put extra weight on the "snackability" of a jerky, and this definitely has me savoring each piece and wanting more. 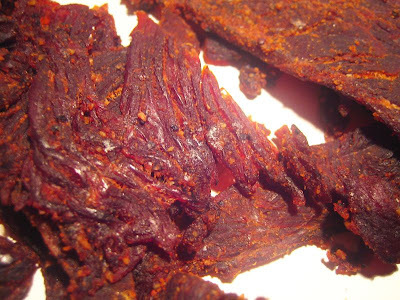 It provides an excellent jerky experience, being tender and moist, and providing an abundance of complex flavors. In trying to find something negative to say about this, I can't find anything aside from that I don't taste much any of the natural turkey flavors. I always like to taste some resemblance of the meat itself. But then I never really was a big fan of turkey jerky anyways. But I love the seasoning blend so much that I'm going to overlook it. I'm going to have get me the two other beef jerky varieties of theirs. I found this stuff while visiting San Diego. I was looking for a quick healthy snack when I discovered this jerky. It's awesome. In fact I'm ordering some on line so I can take it to work with me for a healthy snack. By far the best jerky I have ever tasted! Just bought some at raley's Supermarket in Northern California. Tons of flavor and nice and moist and easy to eat. Flavorwise absolutely top notch. The only complaint I have is that the entire bag was small strands and not pieces, so you needed to eat it in fingerfulls. With the flavor though I would be happy to suffar the inconvenience and get my fingers mess all day. I love this stuff! Just ordered a case! I feel the regular turkey jerky actually has a bit more flavor than the spicy. But I ordered a case of that too! I prefer their turkey over beef, as their beef I've tried is a bit gristly. Great line though, great review. Decided to try them after reading your reviews here, Thanks!